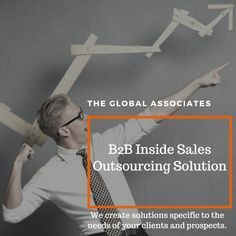 Successfully boosting The Global Associates B2B Lead Generation is an extremely challenging job in this era of ever-intensifying global competition and well-informed customers. Scores of new companies keep mushrooming across the world every day, promising to help their clients create fresh opportunities and effectively maximize B2B Lead generation, and making your road very tough and challenging. The new business environment today with the decision makers having a sea of information at their fingertips makes it imperative that you always remain on your toes and find ways to be a step ahead of your customers; you need to start with definite short and long-term goals and form effective strategies in order to accomplish these goals. The present-day business environment presents several major challenges for lead generators, creating fresh quality leads and converting a high percentage of them into final deals are some of these challenges. To have a more efficient lead management system in place is imperative to make it easier for your lead generation team. Following is an effective four-step formula that would help you improve your working and boost B2B lead generation successfully. Constantly pumping quality fresh leads into the sales pipeline using new and effective strategies is always the first step in your effort to enhance B2B lead generation. Maintaining a good closing ratio by managing leads in hand more efficiently is, no doubt, very important, yet the importance of prospecting can never be undermined. If you focus too much on the existing leads and prospecting takes a backseat, your sales pipeline will dry up one day putting you in a very tight situation. Prioritizing your sales leads is a significant step towards improving your closing ratio, it reduces the pressure on the lead generation team. Planning your lead generation strategy becomes easier having prioritized your leads as it allows you to know what to expect from your existing leads. You can thus plan how much time to devote on different leads. You can keep your employees in fine shape by imparting training on a regular basis. Train them to put up the right, probing questions to elicit the main issues of the prospects. They must know how to develop rapport with the clients for establishing sustainable business relationships with them. The final step of this formula for maximizing B2B lead generation is to have an effective follow-up system in place. A prospect who is not ready to buy just now can turn into a customer at a later stage if you keep in touch with them. You should assign the responsibility of following different prospects to different employees and hope some of them will turn into a buyer sooner or later.